Just three times a week, please « Onward! On my way down to New Orleans for Memorial Day I read that the New Orleans Times Picayune will no longer publish seven days a week. To save money, it’ll hit driveways on Wednesdays, Fridays and Sundays only. I was on the flight down when I got the news. On wifi. On my computer. See the connection…I mean, the writing on the wall? I know. It’s sad. Hey, I shell to hold the Wall Street Journal every morning. I don’t own a Kindle. I gave my iPad to my two-year old. One of my biggest clients makes more paper than just about anyone on earth. I like paper. I like horses, too. I just don’t use them to get around much anymore. It’s easy to understand the end of newspapers, at least the paper part. Fewer readers, less ad money, deteriorating product, fewer readers, less ad money, deteriorating product, repeat until dead. What’s tougher, though, is understanding the end of news. No no, not ALL news. We’ll always care what Justin Bieber does. But what about so-called “local” news? Conventional wisdom says digital picks up the slack. But, the only person losing more money than Mr. Paper Publisher on local news right now is Mr. Tim Armstrong at AOL. He’s trying to build an all-digital local news network, and it ain’t going very well (quick, tell me how much time you spent last week-year-lifetime on patch.com/yourneighborhood). Junk mail went from paper spam to digital spam no problem. But local news? Are people just not consuming it like they used to? A lost appetite? Hard to imagine. But, like they say, follow the money. For local news, it’s not in paper and it’s not online. Maybe the radio guys should sharpen their knives. You know, come to think of it, there are a lot of all-news stations popping up on FM lately. Hmmm. We’ll listen to local news but we won’t read it? Now that Twitter and Facebook tell us what’s really important in our lives, do we only really care about traffic and weather, locally? We are, clearly, in the digital age. We are connected to more people, places and events farther away than ever before. By a lot. Is that having a profound effect on our definition of “local?” This is starting to sound like a book topic, not a blog post. So I’ll wrap it up. 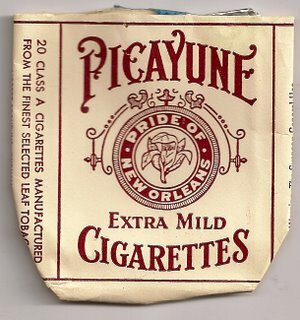 I didn’t know what a picayune was until now. I just looked it up (Wikipedia not Brittanica). It was a Spanish coin, worth half a real. The word stems from the French picaillon, which derives from the Provencal picaioun, meaning “small coin”. What does that say about the Times?